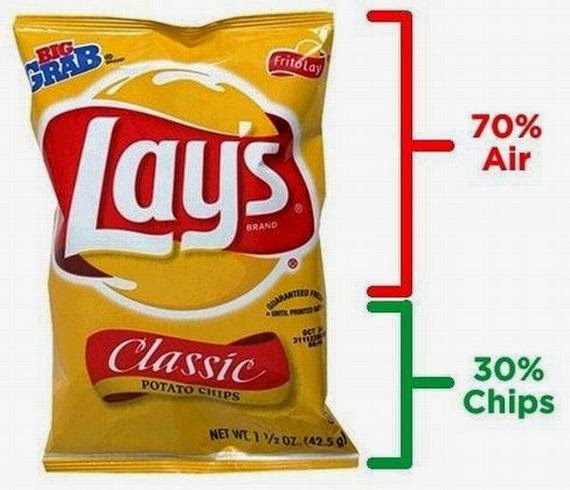 When you've picked up a bag of chips at the grocery store, you've probably noticed the bag is puffed and filled with 'air.' But it's not exactly like the air we breathe the package doesn't contain oxygen. That’s why nitrogen is used. Nitrogen flushing is a process whereby all the air is removed from the bag and replaced with nitrogen gas. The nitrogen doesn’t affect the taste of the food and doesn’t react with it like oxygen does, so the food stays fresher longer. And, since the nitrogen gas fills up the bag, the contents inside are protected during shipping.